Renderings of Pearl St. Passage. The city's biggest event of its kind, DesignPhiladelphia returns Thursday, October 8 through Friday, October 16 with over 130 public programs. This year's theme is "Shift Everything," so the Center for Architecture and its many partners are discussing change, transition and evolution in every aspect of the design world. 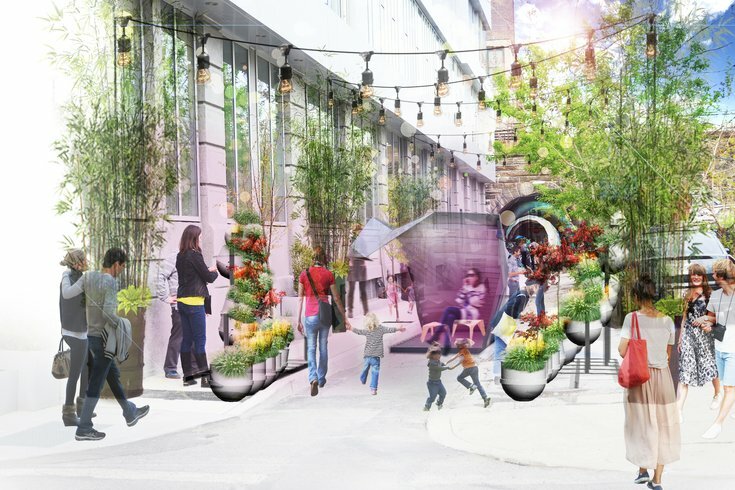 Perhaps the most anticipated event of the week is Pearl Street Passage, a massive art installation in ten parts taking over the 1100 block of Pearl Street. Ten multidisciplinary teams of artists, architects, designers have come together to transform the street, creating individual interactive sections to go with the "Shift" theme. But be sure to check it out early, as it will only be up from October 8 through October 11. The festival will also host the 3rd Annual Fall Geodesign Forum, which will gather at Philadelphia University Friday, October 16. Educators, design practitioners and students will be discussing changes in the urban landscape and the technology which is enhancing urban design. Award-winning designers and writers will head to the Society of Design Conference Thursday, October 15. The multidisciplinary event at the University of Pennsylvania will feature nine speakers presenting inspiring information and case studies to the design community. Other DesignPhiladelphia events include a discussion of applying design thinking to the healthcare system, an artifact-based learning workshop, a networking panel for students entering creative careers and a coffee tasting. View the complete list of events here.